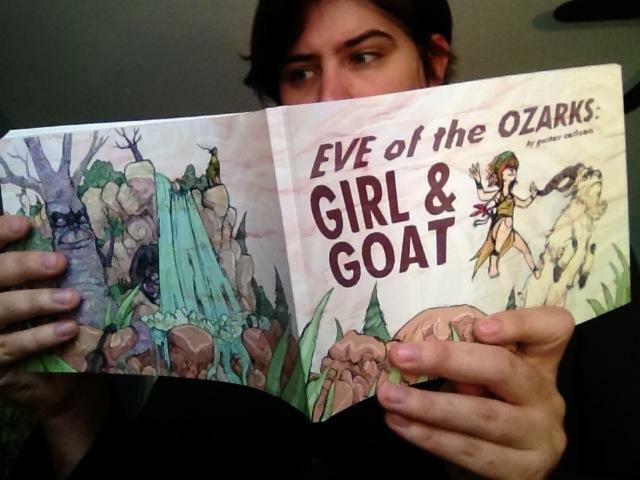 The first print edition of Eve of the Ozarks has arrived! 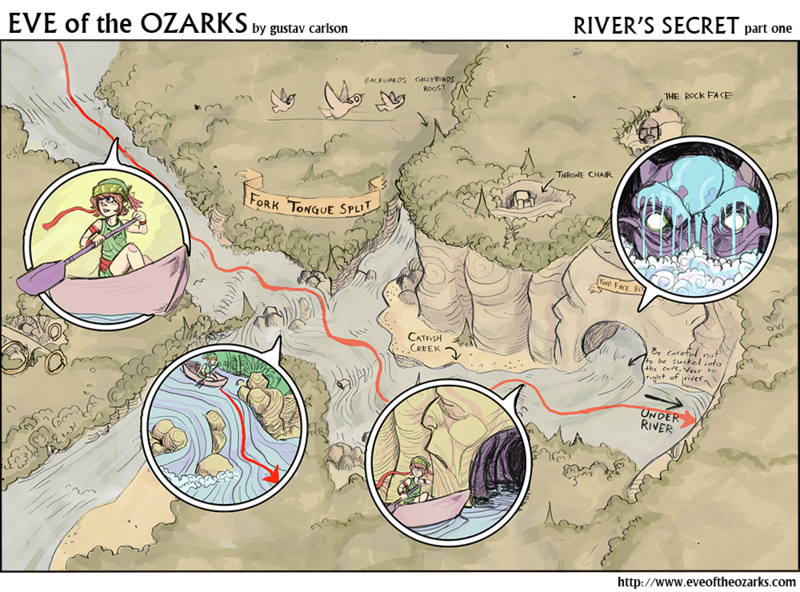 84 full color pages with a fancy wraparound cover! It also includes a short feature on the changing design of Eve and a full cover gallery! 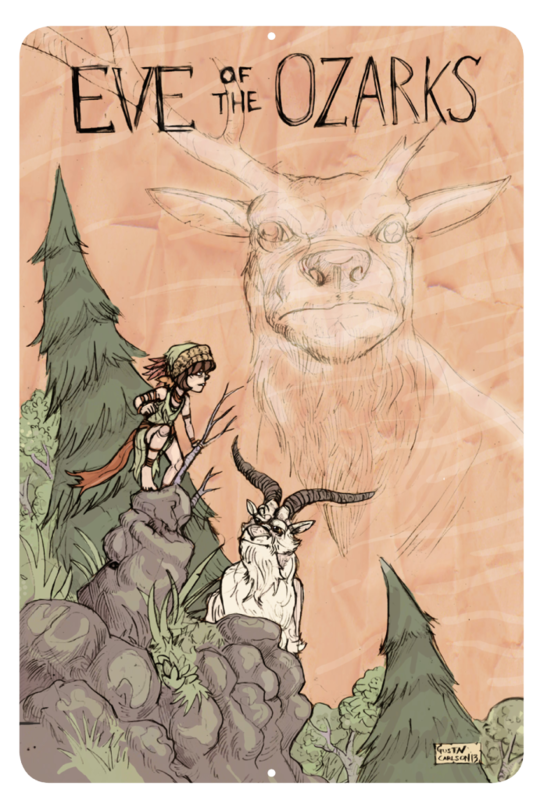 This volume is available in two editions, the Regular Edition or the Sketch Card Edition. 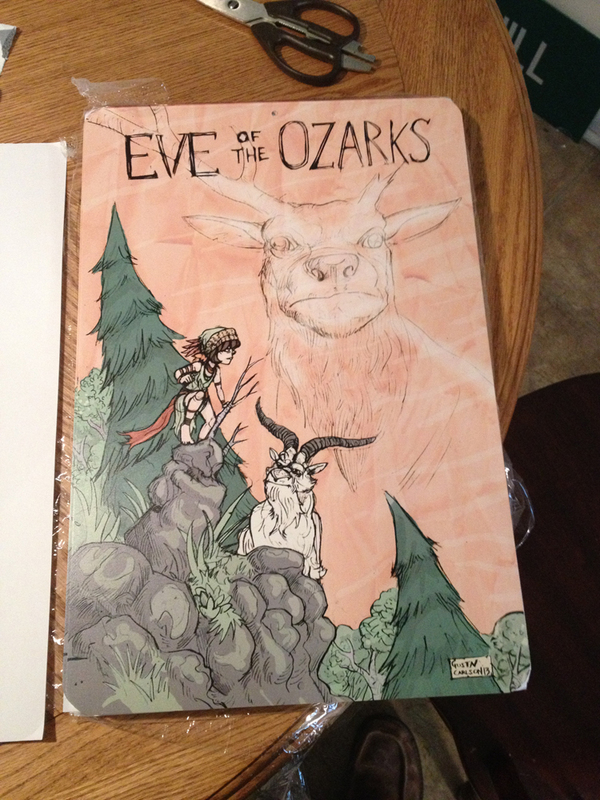 The Sketch Card Edition comes with a small original Eve of the Ozarks ink and watercolor illustration! 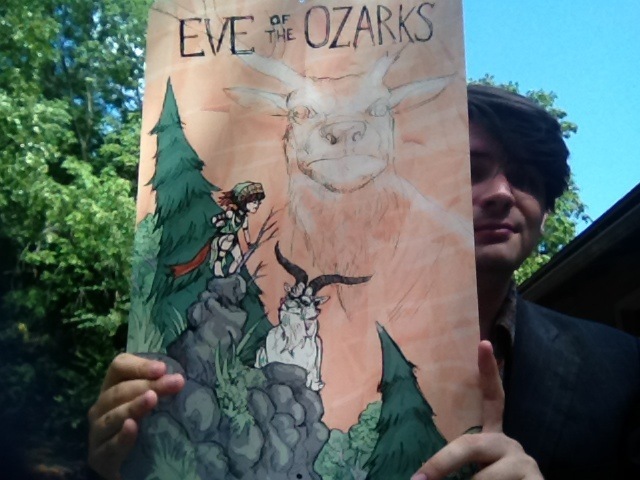 EVE OF THE OZARKS TIN SIGNS! Eve of the Ozarks tin signs are available now! They are 12×18 and have a hole drilled at both top and bottom for easy hanging! Only $40 plus shipping! 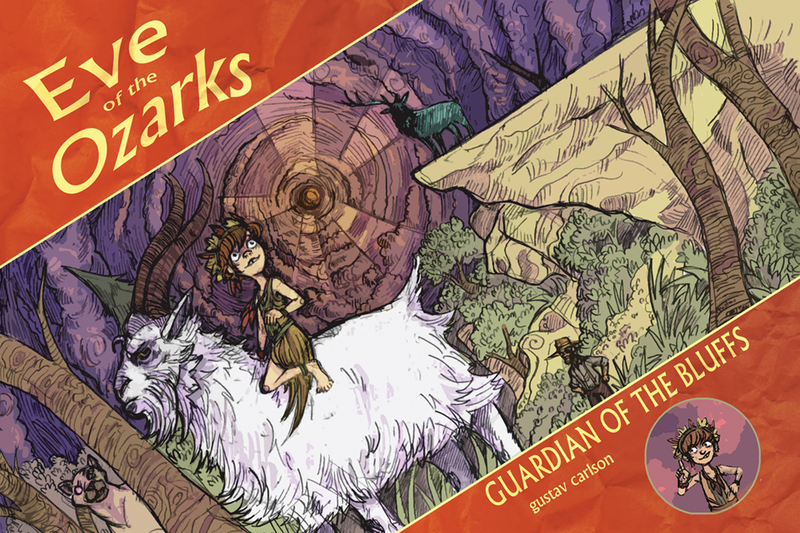 GUARDIAN OF THE BLUFFS– Deep in the remotest part of the Ozark foothills lives Eve, a little girl raised in a cave by her pioneer paw. 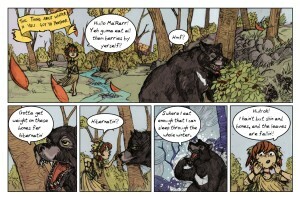 As she explores the untamed wilderness she encounters all kinds of friends in animals, trees, and some things unnatural. 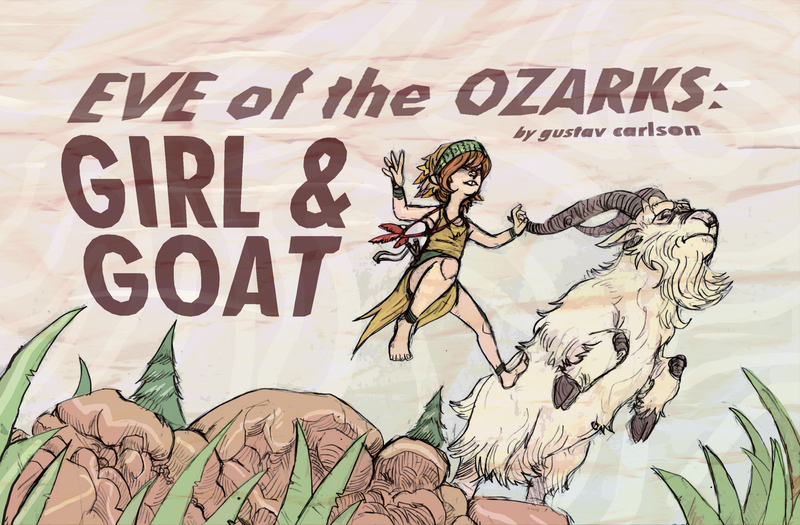 Her and Hieronymus the goat find themselves on a one-way path to the Bluffs. There they will meet the Guardian, and he ain’t the friendliest. 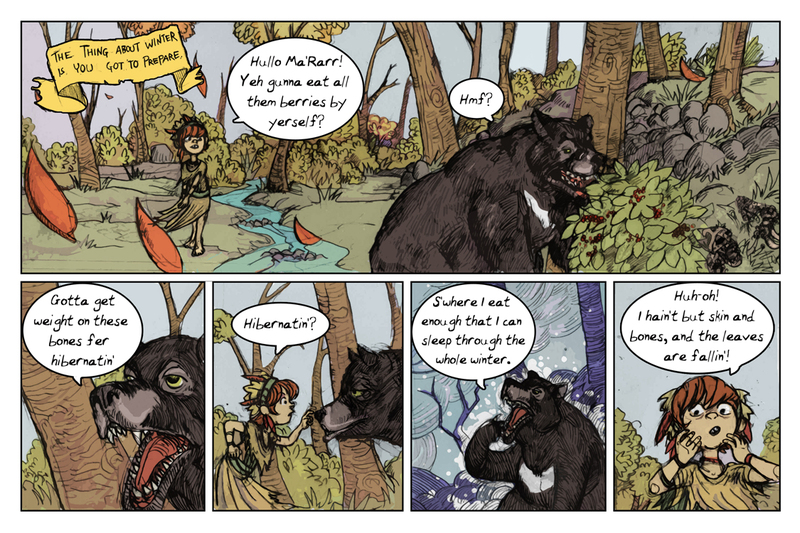 also available on comiXology for 99 cents! 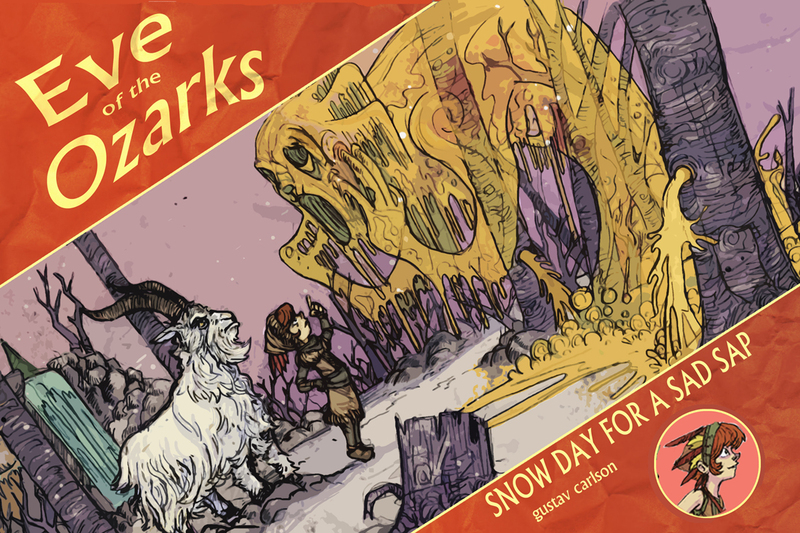 SNOW DAY FOR A SAD SAP– Winter has struck the old Ozarks, and Eve isn’t prepared in the slightest. 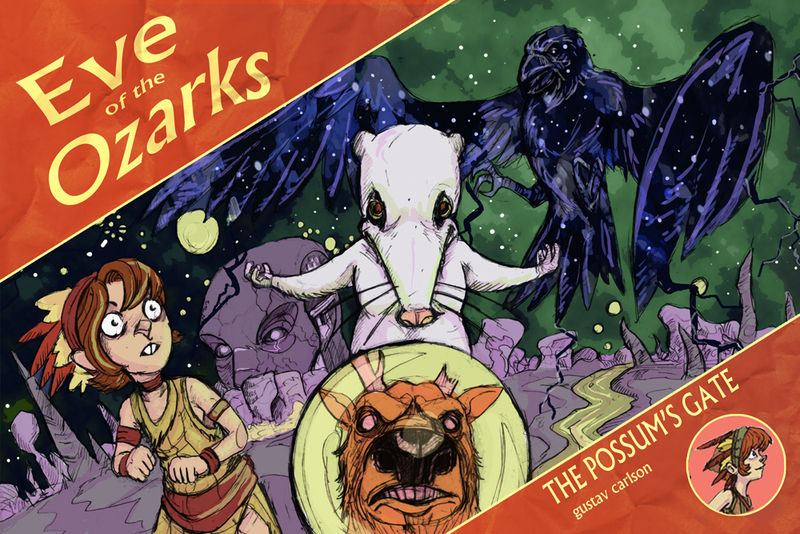 When her and Hieronymus do their darnedest to make it through the snowy season, they are interrupted by a gooey new monster of mysterious origins. And it might take more than walloping this beastie to make its distractions end! 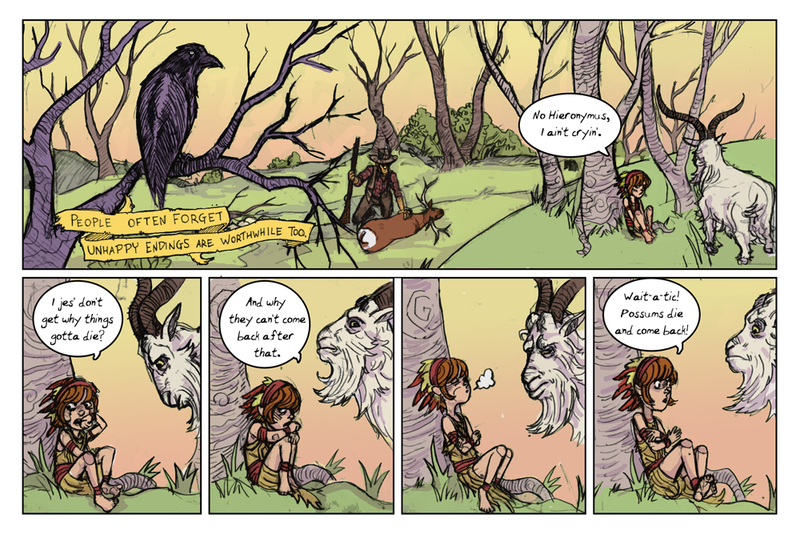 THE POSSUM’S GATE-Eve is not accustomed to loss, nor does she fully grasp why things have to pass some times. Or why the possums seem able to die and come back almost at will. 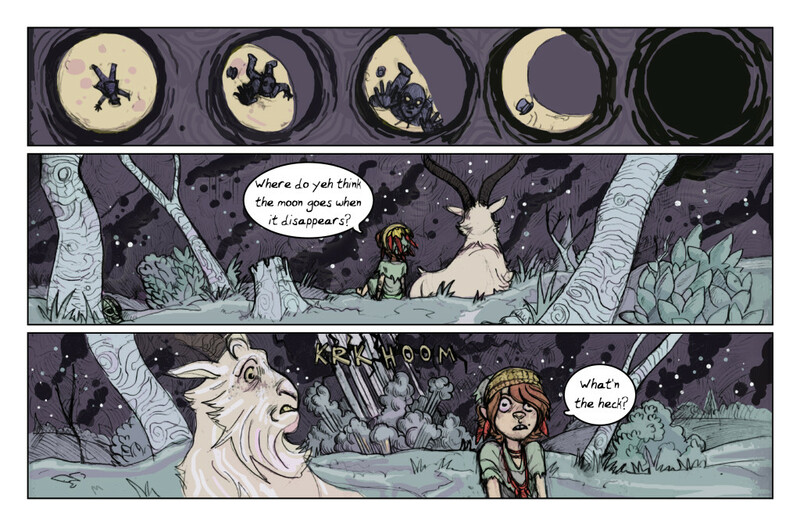 As she searches for answers she finds herself taken to the here’n’after, but will she be able to come back. 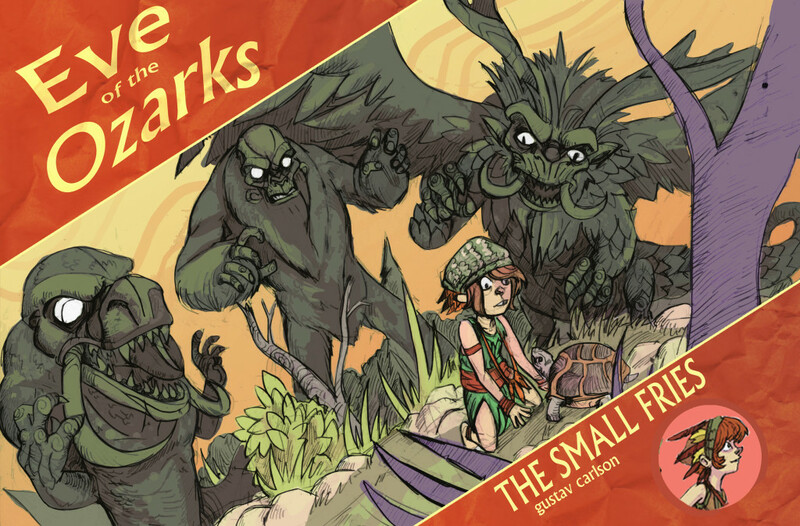 THE SMALL FRIES- This collection features Eve in three short seven page stories! 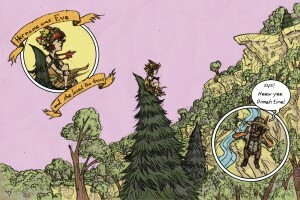 Each has Eve going toe to toe with some of her biggest foes yet! 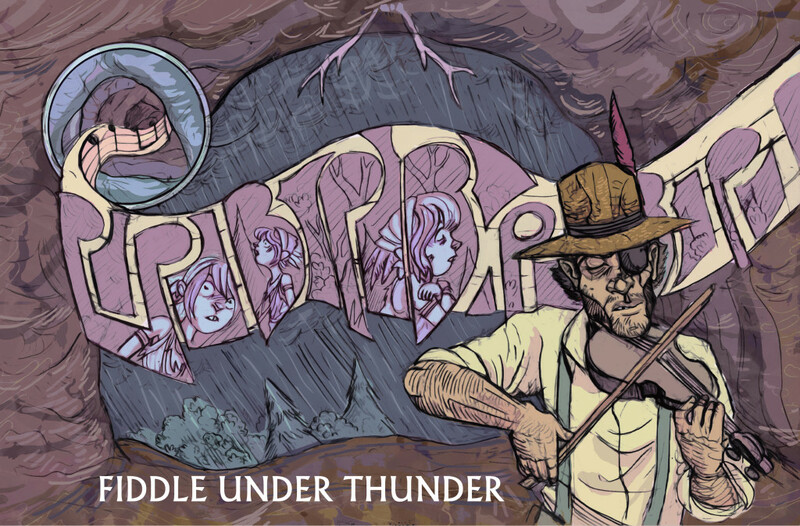 It includes a touched-up version of The Gowrow’s Apples, the Hairy, and a brand-new never before seen story called Fiddle Under Thunder. In this new story Eve must try to find her way home while a Thunderbird brings down one of the hardest storms the hills have seen! MOON EYE’S SHINE- On one particular night the moon seems to vanish from the sky. At the same time a strange man falls from the sky. 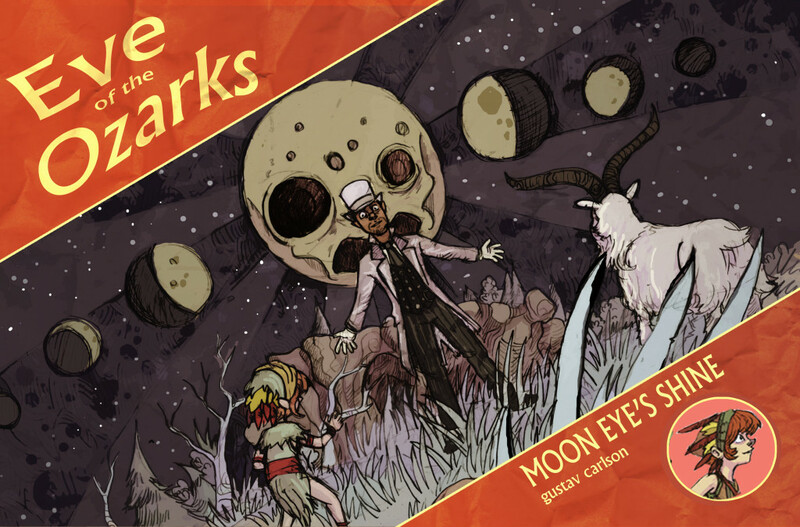 Eve and Hieronymus suddenly find themselves on an adventure to get the man back in the sky before a dreaded creature called the Moon-Eye puts the moon out forever!